Kala Dungar or Black Hill is the highest point in Kutch, Gujarat, India, at 462 m. Ideal time for you to visit the sunset point would be after 5pm. You could take a lot of photos, or just sit and gaze at the white desert. What will draw you into the desert is the search for something intimate in the remote. The desert is a natural extension of the inner silence of the body. The Sunrise and Sunset Times, and Daylength details for Bhuj and Rann of Kutch are available here for you, so plan your travel accordingly. This picture was taken at the highest point of Rann of Kutch. Once you reach this destination, at the car parking area, you will find many camels and their owners waiting to take people up to the actual highest point as some old people may struggle to walk up. Some people just want to experience the camel ride too. A street food vendor prepares and sells local salad and chaat for a living. 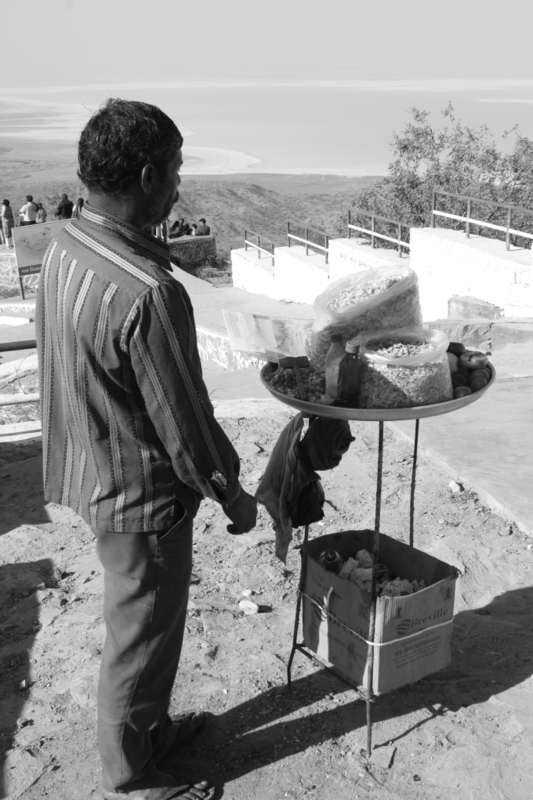 He lives in the nearby village and travels to the sunset point every day for his business. Posing with a biker who we met at the highest point. While I was wearing a beanie with Horns, his helmet had feathers. He and his biker friends were on a ride from Gujarat. There is a 400 year old Dattatreya (God who is an incarnation of the Divine Trinity Brahma, Vishnu and Siva) Temple on Kala Dungar. The priest at the temple prepares cooked rice, which is fed to the jackals after the evening aarti (in which light from wicks soaked in ghee or camphor is offered to one or more deities). Coming of jackals everyday is quite amazing. One can see the panoramic view of Rann of Kutch. As this place is near to Pakistan border, one can also see the Army post on the border. Distance between White Rann of Kutch and Kala Dungar (sunset point) is 90 kms or 55.9 miles. You must first travel to Bhuj before embarking on your journey to Rann of Kutch. Below are travel options you could choose from to travel to Bhuj. By road: You can take a bus from Ahmedabad to Bhuj after 8pm, arriving after 6am the next morning. You will also find private sitting (non-sleeper) buses, and ST (State Transport) buses that are less expensive and less comfortable. Book your bus journey now. Upon arrival in Bhuj, you will find local buses and jeeps to Rann of Kutch. A 4 seater vehicle should cost you Rs 2000/- per day while a 7 seater vehicle should cost Rs 7000/- a day.